Baha fish tacos are supposed to have a few key components: lightly fried flavorful fish, creamy sauce, and crisp cabbage. 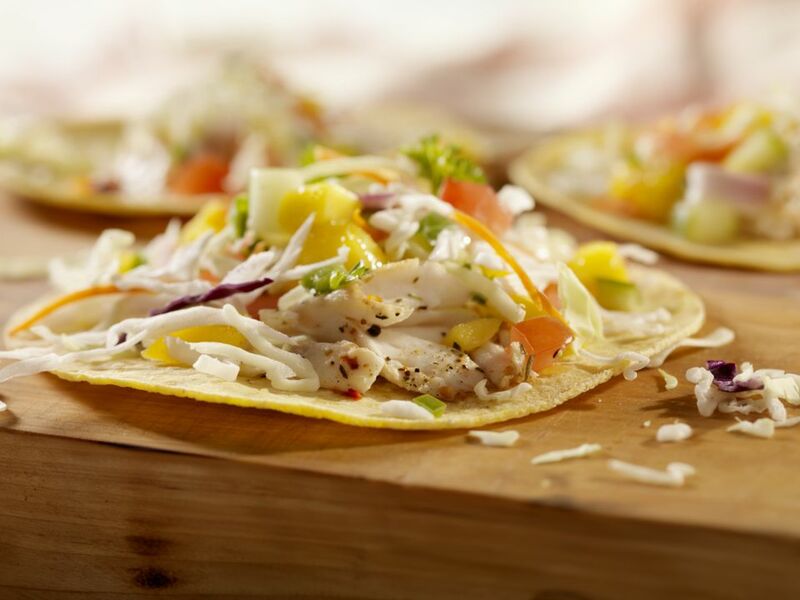 This low calorie baha fish taco recipe has it all, and lacks none of the flavor. A few adjustments such as using lowfat yogurt in the sauce, and using only a little oil for frying greatly cuts down on the calories. If you have the time, and really want to make these fish tacos something special, make your own homemade corn tortillas to serve them in. Pair the tacos with some cooked black beans, and a sweet pineapple granita and you have yourself and impressive and attractive meal. 1. This recipe combines the trademark cabbage and sauce into one component for these baha fish tacos. So, to make the cabbage/sauce combination, place the shredded cabbage in a large bowl. In a seperate small dish, whisk together the plain yogurt, lowfat mayonniase, white vinegar and the salt. Whisk well until the mixture is well combined. Then, pour the sauce over the cabbage, and use a fork to toss together the cabbage with the sauce. Place the cabbage mixture in the fridge until ready to serve the tacos. 2. Next, prepare the fish. Sprinkle the cod or halibut pieces evenly with the salt and ground black pepper. Then, in a large, shallow dish, use a fork or wire whisk to mix together the all purpose flour, ground cumin, and ground red pepper for the breading. 3. Heat the olive oil in a large skillet over medium-high heat. Then, one at a time, dredge the fish pieces in the flour mixture, covering all sides of the fish with the flour mixture. 4. Place the dredged pieces of fish in the skillet with the hot oil. The oil should form small bubbles around the fish as you place it in the pan. This is how you will know that oil is hot enough. If the oil is splattering intensely when you place the fish in the pan, the oil is too hot and you should turn down the heat a bit. Cook the fish about 2-3 minutes per side. The fish is done when it flakes easily with a fork. Cook about 6-7 pieces of fish at a time depending on the size of your skillet. You just do not want to overcrowd the pan too much or you will end up with soggy fish. 5. As the fish pieces finish cooking, place them on a wire rack set over a baking sheet and place them in a warm oven (around 170 degrees) while you cook the remainder of the fish. This will keep the fish warm and crisp. 6. To prepare the tacos, warm the tortillas by placing them in small skillet warmed over medium heat, and warm for a few seconds on each side until soft. Then fill each tortilla with a couple strips of fish, top with a spoonfull of cabbage mixture, and garnish with chopped cilantro, and salsa of your choice. We prefer using a simple pico de gallo, or a sweet mango salsa to top off the tacos.